On October 10 2003, Ebadi was awarded the Nobel Peace Prize for her courageous efforts for democracy and human rights, especially for the rights of women and children. The selection committee praised her as a "courageous person" who "has never heeded the threat to her own safety". Now she travels abroad lecturing in the West. She is against a policy of forced regime change. Her husband, Javad Tavassolian, was an advisor to President Khatami. 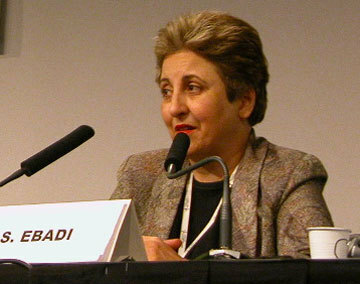 She presented a book entitled, Democracy, human rights, and Islam in modern Iran: Psychological, social and cultural perspectives (2003,Bergen: Fagbokforlaget), to the Nobel Committee. The volume documents the historical and cultural basis of democracy and human rights from Cyrus and Darius, 2,500 years ago to Muhammad Mossadeq, the popular Prime Minister of modern Iran who nationalized the oil industry. 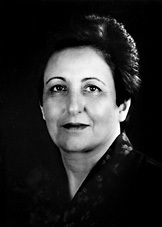 "The Norwegian Nobel Committee has decided to award the Nobel Peace Prize for 2003 to Shirin Ebadi for her efforts for democracy and human rights. She has focused especially on the campaign for the rights of women and children." This was the first sentence of the Committee's announcement on 10 October of this year's Peace Prize Laureate. I believe this announcement has already changed your life, Shirin Ebadi. Your name will shine in the history of the Peace Prize. Let us hope that the prize will also inspire changes in your beloved home country, Iran, as well as in many other parts of the world where people need to hear your clear voice. And let me hasten to add – this applies to the western world as well. Fundamental values, such as liberty, justice and respect for human rights will – in all places and at all times – need vigilant and critical champions.